In a previous blog post, I wrote about the fact that we tend to perceive software design as userless. Software design is not userless. The user is the developer that will have to change the code after you do. If you have collective code ownership (like most Scrum teams these days), you’d better consider user-centric software design. Ideas such as “Clean Code” touch this idea. But I’d like to explore this topic in detail. Why is usability of web applications such an important topic today? I would argue that it brings a competitive advantage because users find it easier to start and use an application that’s built with the user in mind. No user has time to spend days learning a new product; we want to start using it immediately and get instant benefits. The new users of software design are the new developers joining your team. We will assume they know the programming language, the main framework used and have worked in the business domain before. How long does it take for them to become productive in your environment? The time spent familiarizing with the design of the application and with how things are done mostly translates to expenses. In the economy of the product, that’s waste. Think about the type of work you did on your current product. Chances are some of them are repeated patterns. In the eHealth application we’re developing, the first few features took a while to get done (NB: we were also learning a new technology at the same time). By carefully looking at what slowed us down and adjusting the design, we optimized the development and got to the point where about 60% of the work is the UI/UX design. The development was no longer the bottleneck. We then looked at optimizing the UI/UX design, but that’s another story. Since we know from that roadmap that more work like that will come, we started optimizing for these types of work. Occasionally, we have to do a new type of work that takes longer. One example was a drug search service that is fast, scalable and easy to update to the latest version of an official drug database. We had to learn and use vertx and mongodb to do it, and it took about 3-5 times as much as the usual tasks. Since that is a local situation that is unlikely to repeat, we did nothing to optimize for it. The point is this: like an application that’s easy to use for most common tasks, usable software design allows fast implementation of most common types of features. We’re using a Kanban / XP process, so we used the cycle time distribution diagram to identify the outliers. We have a recurrent retrospective every two weeks where we discuss the impediments and identify potential solutions. The implementation was made in the next two weeks, and we kept an eye to the cycle time distribution in the next months. It was easy to see the improvement since most items moved to the left. The cycle time distribution diagram, with post-its. Numbers on the post-it represent the cycle time. Qualitative: run a recurrent retrospective on the topic of usable design. Ask developers what takes them longer than it should. In a team where there’s trust and transparency, you will immediately identify the issues. Measure the time it takes them to do it. Write down where they get stuck. Use the feedback to improve the product. Make sure to tell the participants that if they don’t know how to do something, it’s the design’s fault and not theirs. Encourage them to ask questions when they get stuck. A complete test with one person shouldn’t take longer than 1 hr. Start with the most typical tasks first, and with as little information as possible. Only offer information when the person gets stuck or asks for help. Prepare about 10 tasks, but be prepared for partial results. 5. How Does Usable Software Design Look Like? Let me start by saying that the idea of focusing on developers as users of software design is very new. I have seen work around this topic, and I’ve done some myself; past literature on design has touched this topic without making it explicit. Here’s a screenshot from an application I’m developing. Can you tell what it does based solely on the namespaces? I first heard Sandro Mancuso talking about this idea at I TAKE Unconference 2014, and I was very interested to give it a try. I see it as a very good start for usable software design. I still have to figure out a better place for the InvoiceFileNameGenerator, as you can clearly see. This is a violation of the third principle, minimizing the unexpected. We’ve seen above that a feature namespace consists of three types of classes: a request class, a controller class and a view class. There’s an additional level of consistency that you can reach, specifically the interface of each of these types of classes. In this example, all the Request classes above have one method: response(). All controllers have one method: render(). Each controller uses a view to render the information. This is consistent across feature namespaces. and easier integration of new people in the project. To obtain usable software design, we need to get feedback from its users, namely the developers. 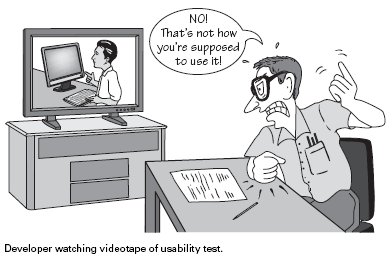 There are two ways of doing it: through retrospectives and by running usability tests. This idea is not entirely new. Principles such as clarity and consistency have been used for many years to obtain better design. The idea of usable software design is however a change in perspective; thinking of the developer as the user of the software design and actively trying to get feedback from them will bring forward changes in the way we’re organizing our code. I have been inspired in writing this post by many conversations with: Sandro Mancuso, Samir Talwar, the attendees at SoCraTes UK, Rebecca Wirfs-Brock, Adi Bolboaca, Claudia Rosu and many others.